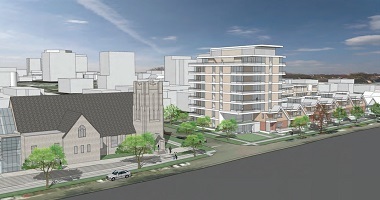 By a 10-0 vote, councillors approved rezoning parts of two blocks at West 45th Avenue and Yew Street to allow an eight-storey residential tower and five-storey addition to Dunbar Ryerson United Church. “It has met the test, which is not easy to do in these times, but we appreciate the extra that’s been gone to,” said Mayor Gregor Robertson moments before the rezoning passed. . . The church has partnered with Wall Financial to demolish current units it owns next to the church to build a tower with market housing. Proceeds from that will fund renovations to the church, along with the building of a community centre and 32 units of social housing. He added that while there has been opposition, it has not been as significant as with some other neighbourhood developments; 74 percent of correspondence from residents and 20 of 29 who attended the hearing supported the project. To check out the nature of the opposition go to Ryerson-Vancouver Neighbours and CityHallWatch. 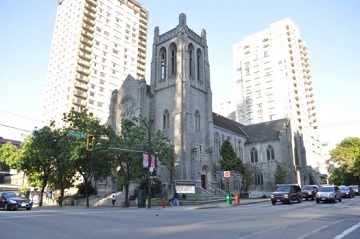 The two-storey neo-Gothic stone church, built in 1928, will be restored as part of the project. The project covers one-and-a-half city blocks on either side of Yew Street on the north side of 45th Avenue. Vancouver Heritage speaker Kate Robertson discussed ways to conserve and restore St. Andrew’s-Wesley United Church. Come to St. Andrew’s-Wesley Church [November 1] to hear Kate Robertson, Heritage Consultant at Donald Luxton and Associates, explain the process and considerations for creating a restoration plan of a Heritage Register ‘A’ building. Designed by architects Twizel and Twizel and completed in 1927, this Gothic church was built of granite and local Haddington Island stone, and was inspired by Durham Cathedral in England. Kate will speak about the process of creating a conservation plan including identifying significant features to be considered in a future restoration, the history of the site and story behind several stained glass windows as well as future plans to replace the roof. Vancouver Heritage hosts all kinds of events, including house tours, walking tours and much more. What were they thinking, our men who marched away a century ago, straight toward Hell on the Western Front? 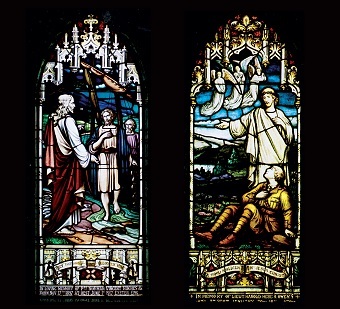 Come – and listen – as Lieutenant Harold Owen and Private Norman Hughes step out of their stained glass windows on the east wall and Lieutenant-Colonel William Hart-McHarg leaves his plaque in the military alcove, to tell us of their lives. In a staged reading of a script by Cathedral parishioner Anne Fletcher, we will live through the Great War, singing the anthems and hymns of Christ Church of 1914-18, hearing stories from the trenches, and remembering the deaths of those who once sat in our pews. This special Remembrance Day observance is in honour of all members of Canada’s Armed Forces, past and present. By donation.